We thank you for continuing your awesome generosity, by God's amazing grace and blessings, in carrying out our mission to serve meals and offer hope, with dignity, to the hungry, the homeless, and indigent poor across Rhode Island. 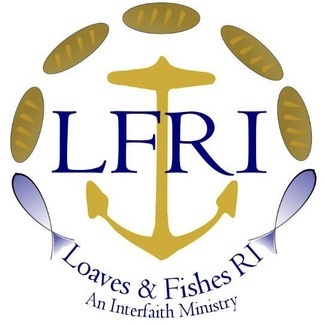 We invite you to participate in St. Paul's next Loaves and Fishes run on Tuesday,March 12, 2019 at the Emmanuel House shelter in Providence. Our LFRI runs occur on the second Tuesday of the month. If you are unable to help with this run, there will be many more opportunities to participate. Many tasks noted below require completion BEFORE the start time; please be punctual. You may leave NON-PERISHABLE items in the Narthex (basket is marked LFRI) at any time. Most PERISHABLES can be left in the Parish Hall Kitchen refrigerator on the Sunday morning prior to the run, OR (note change) in the cooler on the steps outside the Parish Hall kitchen on the day of the run. We appreciate your continued prayers and support for this ministry. See and be a part of love in action! Come, give, work, pray and celebrate with us God's amazing grace at work in the world, in our very midst! Open kitchen 2 hours before START TIME. Supervise food preparation, clean up. Arrive 1 hour before START. Load truck with all food and supplies. One or two drivers pick up and return truck in Barrington. One driver needed for the run. One hour before START time, fill water tank and prepare truck for run. Can go on the truck or follow in cars. Please indicate your willingness to drive your own vehicle. 6 dozen fresh 6 INCH torpedo rolls for meatball sandwiches. PLEASE DELIVER TO THE PARISH HALL NO LATER THAN 3:30PM. 12 dozen (144 Thin Slices) of Provolone Cheese for meatball sandwiches.PLEASE DELIVER TO THE PARISH HALL NO LATER THAN 3:30PM. 8 large jars of sauce for meatball sandwiches. PLEASE DELIVER TO THE PARISH HALL NO LATER THAN 3:30 PM. 288 individual frozen 1/2 ounce meatballs. Indicate the approximate number of meatballs donated in the comment section.PLEASE DELIVER TO THE PARISH HALL NO LATER THAN 3:30PM. 72 Desserts. Preferably homemade cookies, brownies, etc. packed (2-3) in ziploc bag. Each bag counts as one portion. Deliver to Parish Hall at least 1 1/2 hours before START time. Cannot distribute cracked eggs Deliver hard cooked eggs in carton to the Parish Hall kitchen at least 2 hours before START time. 6 dozen individually wrapped servings; deliver to kitchen no later than 2 hours before START time. 72 pieces of whole fruit. Deliver to the Parish Hall kitchen at least 2 hours before START time. 72 Individual servings juice- plastic bottles or juice boxes. Deliver to the Parish Hall at least 2 hours before START TIME.